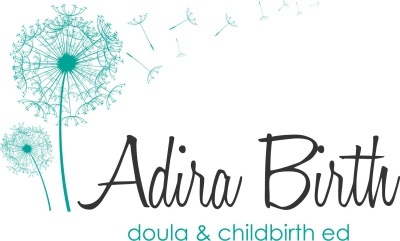 I am a ToLabor certified professional birth doula. Unlimited phone, text, or email communication through your pregnancy and postpartum period. I am on call for you 24/7, 2 weeks before your due date until you deliver your baby. Initial free no-obligation interview to answer any questions you may have and get to know one another. I always work with a back up doula in the rare event that I will not be able to attend your birth. You and my back-up doula can communicate to your comfort level. As a childbirth educator with a Master's in Teaching, I am uniquely qualified to design your doula prenatal visits around topics that are relevant to you. Doula prenatal visits do not substitute for quality childbirth education, however. I love doula prenatal visits to be hands on with exercises for optimal fetal positioning, acupressure, birth art processes or pain coping practice with holding ice. Having had childbirth classes facilitates your getting the most out of your doula prenatal visits. I am happy to recommend a childbirth educator and I offer a $25 discount for my own childbirth education classes for doula clients. I am trained in acupressure for labor with Keith Bell, an internationally recognized expert in holistic health and Licensed Acupuncturist. I include a 30-40 minute acupressure session at the second prenatal visit (usually at 37 weeks) in the base fee, with the understanding that it will substitute for some discussion. (Prenatal visits are about an hour and a half). Additional weekly acupressure sessions are available at 36 weeks onward for $69 each. When you are in labor, I will join you when you need me, at your home or the hospital and stay with you through the birth of your baby. I offer aromatherapy if desired, acupressure, counterpressure, amateur labor and birth photography and I help facilitate your informed choices. I help the partner understand what is going on, and give him or her ideas for how to support the laboring person, as well as provide support for the partner as they step over the threshold of parenthood. I will stay 1-2 hours after the birth. I will help you breastfeed if desired, and help get you settled and nourished. I visit you in the first two weeks of your birth. 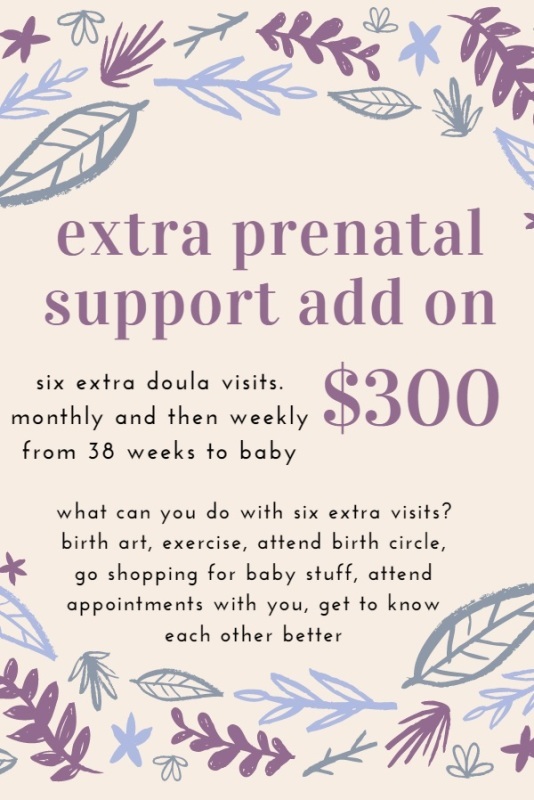 This is a time to discuss your birth experience, signs of postpartum depression, breastfeeding, going back to work, family adjustments and help you get access to any resources and support you may need from other sources postpartum. I am trained in how to get breastfeeding off to a great start and normal difficulties and issues and can assist at our postpartum meeting. I also am trained to recognize when you may need the support of a breastfeeding specialist and am able to help you access those resources should you need them, in those lovely but sleep deprived early days when you just need someone to hand you a list of numbers to call. I am a CAPPA certified postpartum doula. My priority as a postpartum doula is you, the birth parent. I am there for you. Meeting your needs so that you can meet the needs of your growing family is my priority. Looking out for you while you step over the threshold into motherhood (whether for the first time or the fourth) is a service that I am honored and humbled to provide. Light housekeeping, laundry, dishes, preparing meals, snacks and drinks, running errands, sibling support, pet care: these are all things I am happy to do as a postpartum doula so that you can focus on recovering from your birth and nurturing your new little one. I'm also happy to babywear and nurture your new baby so that you can spend quality time with your older children. Even fifteen minutes of one-on-one time with an older child can help ease both your and their transition into your growing family. My experience as a birth doula and childbirth educator makes me uniquely honored to listen to your birth story and help you process your experience as you make your postpartum return. I am well trained in newborn and new mom care, and can answer your questions with evidence based information, as well as guide you to resources so that you can start down this journey of parenting (whether it's your first or your fourth baby) with confidence. I can help you with tips and tricks for normal recovery from vaginal or Cesarean birth. I can assist you with your latch, breastfeeding positions and help you troubleshoot common challenges, all while keeping an eye out for signs that you may need the help of a lactation consultant or other specialist. I always have resources ready for you to call should you need help with something outside of my scope of practice. I always bring my camera with me and am ready to take candid photography of your early postpartum period, documenting the family in this special time. I do not edit the photos but do provide them to you quickly in a secure and private online gallery for you to download.